For many people, a garage is a multi-purpose space, not just a parking space for a car. In a garage you will often find electrical panels, garbage cans, work stations with a variety of tools and batteries. Items that simply don’t have another home, due to a lack of storage space, will commonly be found in the garage as well. From a safety perspective, this means that there are a number of potential causes for fire. Here are the annual garage fire statistics, from the US. 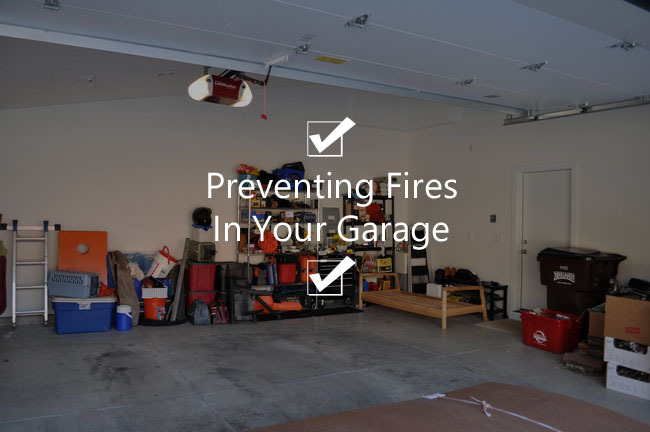 Are you aware that the leading cause of home garage fires is electrical malfunction? Most commonly the problems are shorts in the wiring, damaged wiring and overloaded outlets. Do not store combustible items such as gasoline, oil, propane, paints & varnishes in your garage. Whenever you can, store these in a shed away from your home. If you have appliances in your garage, keep flammable items away. Many people charge batteries for power tools in their garage. Have only one charging pack plugged into an outlet. Do not use an extension cord with a battery charging pack. Install a 20 minute rated fire door, self closing and self latching, between the garage and home. If you have a room above the garage, make sure the garage ceiling has been drywalled. If you have a wall attaching the garage to your home, also ensure that the garage wall is drywalled. If you have attic access from your garage, use an attic hatch cover. We want to help keep you safe. If you have any questions regarding safety concerns with your garage, please don’t hesitate to contact us.